Parent Mentors for School – Making Connections. Finding Solutions. A joint venture between GCPS and the Georgia Department of Education, this program helps build a bridge between families and schools by developing understanding, respect, support, and the communication skills needed to support a home-school partnership focused on student achievement. For more information click on http://www.parentmentors.org. There are other mentors. See the website for current information. 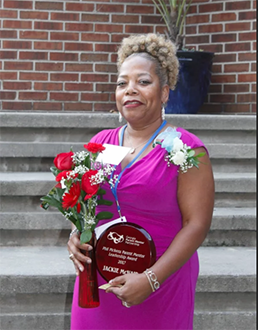 Gwinnett County Parent Mentor Jackie McNair has been named recipient of the 2017 Phil Pickens Award. The award acknowledges the hard work and contributions of a parent mentor who has dedicated his or her career to improving the educational and postsecondary outcomes of students with disabilities and guiding the work of special education school staff and parents. The Phil Pickens Award is named after the late Phil Pickens who served as state director of the Georgia Department of Education Special Services Department and founded the Georgia Parent Mentor Partnership.